Your makeup must be suitable to the texture of your skin. You should avoid anything that might be allergic to your skin. Check the contents of your makeup to make sure that everything in it is safe for your skin type. If your skin is sensitive, you will have to make extra efforts for choosing the perfect makeup for your skin so as to avoid rashes. Do not try out an entirely new brand of cosmetic on your wedding day, it might not suit your skin and will cause unforeseen problems. Keeping your color tone in mind is very necessary. That doesn’t mean that you have to be super fair to look good. You just need to figure out what shades of makeup will suit your skin tone. While choosing your makeup, try it on yourself rather than choosing it from the shade cards. What looks good on the shade card might not suit you best. The only definition of perfect makeup is the one that suits you. You surely wouldn’t like to see your entire makeup vanishing or mixing up with each other due to moisture from any source. 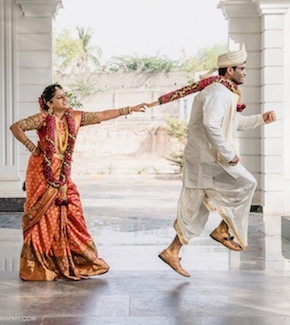 Wedding functions are exhaustive and no matter how much precaution is taken, you will sweat. It can be because of the weather or anxiety on your wedding day. Take special care of your eye makeup. As your big day is full of emotional moments; you might end up with teary eyes. Therefore, opt for waterproof eye makeup no matter how the weather is. Your makeup must compliment the outfits and accessories you have planned for the day. Choose the shades of your makeup in accordance to the shade of your outfit. It’s not necessary that all your makeup should be exactly similar to the shade of your dress, but make sure that you are using the right shades to go with your dress. Contrasting makeup also needs a lot of thought and care while choosing it. To get the perfect makeup on your wedding day, you must make sure that your makeup is balanced. For example, if you are doing heavy makeup on your eyes, try to be light on the lips. This creates a balance and you can avoid looking gaudy or too loud than required. 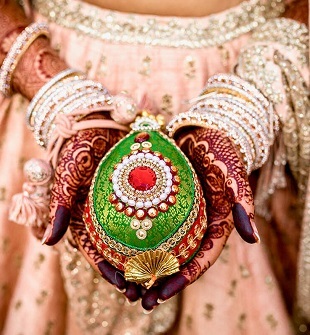 Also, if your jewelry is very heavy as is frequently in Indian weddings, you should take care that your makeup isn’t taking all the limelight away from it. Give your dress and accessories some space, by balancing your makeup. 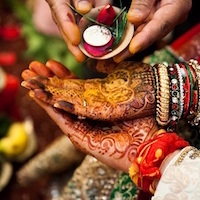 Your wedding rituals and ceremonies are going to take time. It’s not a matter of an hour or two. So you need to prepare for it. Among other preparations, make sure that your makeup doesn’t start wearing up after a while. It’s going to be a long day and you will absolutely want to look stunning throughout the day. While choosing your makeup, choose the one that will be on your side as long as you need it too! With all these things taken care of, you are ready to be one of the gorgeous brides that had ever been! Good luck, beautiful!